The future of British manufacturing is of immense importance and topicality. As we slide towards a service sector economy based on finance and tourism, it is worth reflecting on whether this is the most appropriate or inevitable scenario. 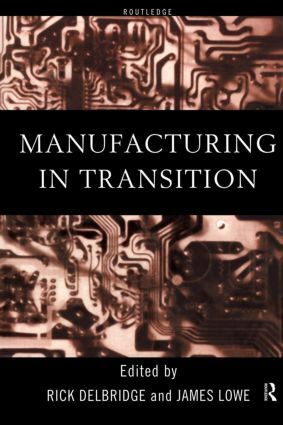 Manufacturing in Transition makes a genuinely interdisciplinary contribution to the debate over the UK's strategy for industrial renewal. Aimed primarily at business, economics and industrial relations students, it looks at the current state of British manufacturing sector within the global economy and asks whether manufacturing matters in the twenty first century. This is a timely assessment of the UK's industrial development and makes a major contribution to debates over the industrial strategy and the position of manufacturing within industrialized economies.